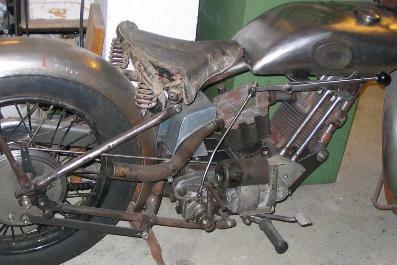 With the silencers available, I could finally go ahead and try out how to route the exhaust pipes. 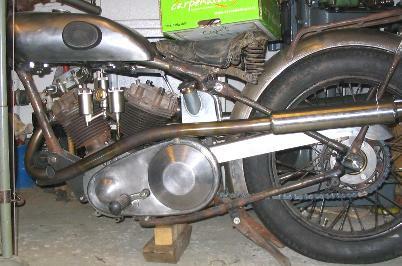 For the timing side pipe I had already made a pattern out of leftovers from my 680 Brough restoration. 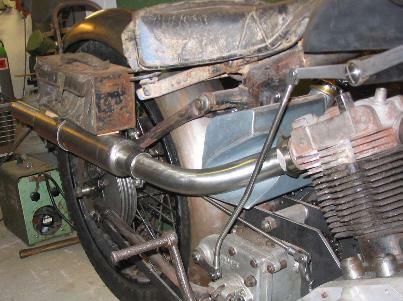 With the timing side silencer fitted, I could start to route the drive side pipe. 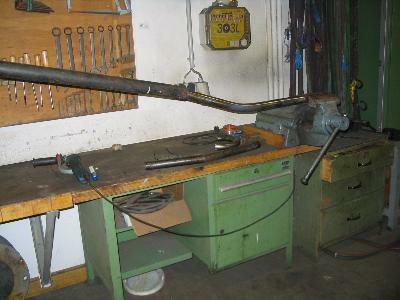 Slight bends in the pattern pipe can be made by making a number of saw cuts, which yields a kind of flex-pipe, and welding. 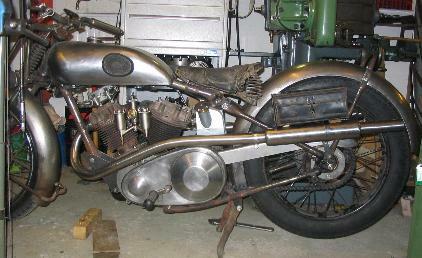 I was aware that the narrow bend at the front end would be very difficult to make, especially in stainless steel. So I used readily available pipe bends here. Unfortunately these were a bit too narrow, so I stuffed them with sand and opened them up a bit. After much cutting and shutting and a number of welding spots made and opened up again I finally found a shape I was satisfied with. Now it was bending time again. 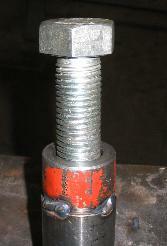 The front bit, made from the above mentioned pre-fabricated pipe bends would be re-used, but the rest would need to be bent from a single tube. I did not want to go wrong with this long pipe and did some research on the internet - I wanted to know if there are some secrets in stuffing and heating the pipe. After a long search I found a page by a keen Welsh buggy builder, Robert Frost-Stevenson. 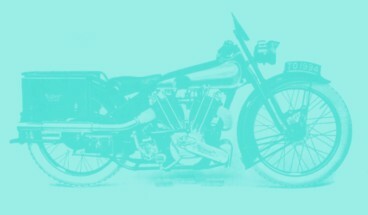 Have a look at his page http://www.rorty-design.com/content/sand_bending.htm if you are interested. From him I learnt that stuffing and ramming the sand is not enough, you can do better by compressing it with a thick bolt in one of the plugs welded into the pipe ends. 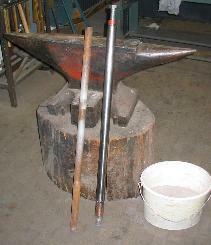 So, after ramming the fine, dry sand into the pipe (a big anvil is very helpful, and a heavy ram rod is a must!) I welded the upper plug to the pipe, in which I had cut a M24 thread before. I had really done my best to compact the sand when filling it into the pipe. I had used the ram rod extensively after each small cup full of sand added and thumped the whole pipe many many times on the anvil. I could hardly believe it: thumping the pipe again and again, I could turn the bolt in many many turns until the sand seemed to be totally tight! So, a big THANK YOU to "Rorty Design", and I hope having properly cited Robert's work the ancient Irish curse quoted in his copyright annex will not hit me! 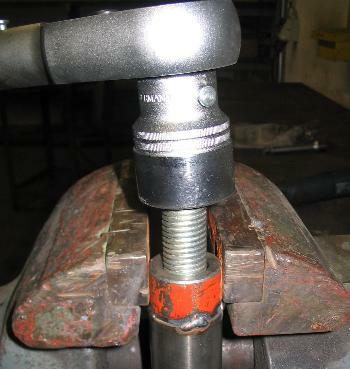 Thus prepared, all you need is lots of heat, a big, sturdy vice, and, in case of stainless steel, some physical strength or at least a long leverage - even when red hot, stainless steel is still pretty tough! 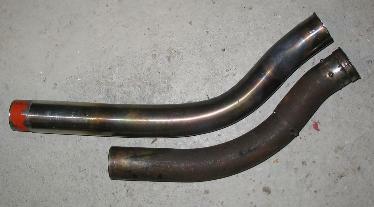 So, this is the pattern and the pipe thus bent. Of course I took the opportunity to make the bend in the middle a bit nicer than the one on the pattern. Now it was more or less a matter of finding the right spot to cut and join the two sections. I took my time to do this, taking off small bits of either side until the two matched nicely. This is the pipe after welding and some polishing. Ah, of course we need something to hold it to the cylinder barrel. I turned rings which I welded to the front ends of the pipes. Here, I have made the attachment clamps and I have fitted the toolboxes as well.